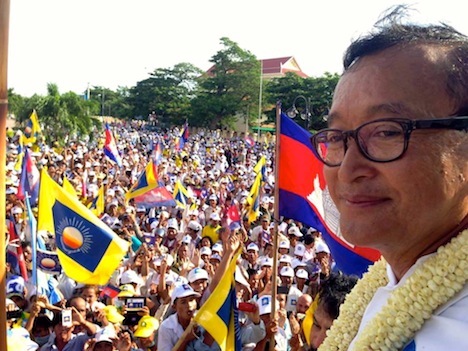 There’s every reason to believe that in a free and fair election on Sunday, Cambodians might choose Sam Rainsy as their next prime minister. The opposition leader returned to Phnom Penh, the Cambodian capital, to much fanfare last week after four years self-exiled in France to boost the chief opposition party’s hopes to win power in Cambodia, having been granted a royal pardon for the various crimes that the Cambodian government had alleged against Rainsy, a former finance minister who’s been Cambodia’s chief opposition figure for nearly two decades. Though he has not been allowed a spot on the ballot in Sunday’s vote, the timing of his return left the opposition riding a crest of optimism that the election would see them to their best result in nearly three decades of rule by longstanding prime minister Hun Sen. Despite gains for the Cambodia National Rescue Party (CNRP, គណបក្សសង្រ្គោះជាតិ), a merger of what used to be known as the ‘Sam Rainsy Party’ and the Human Rights Party, another small party formed in 2007 to promote liberal rights and democracy in Cambodia, Rainsy’s newly unified efforts seem destined to come up short after Sunday’s elections. Instead, Hun Sen and his Cambodian People’s Party (CPP, គណបក្សប្រជាជនកម្ពុជា) is set to cruise to a fifth consecutive reelection — Hun Sen, who has held power in Cambodia in some form since 1985, came to power with the support of the Vietnamese military upon the fall of the Khmer Rouge regime that, in four years, managed to kill 25% of the Cambodian population in its attempt to impose a communist state in the southeast Asian nation. Hun Sen’s ties to Vietnam remain strong to this day — critics would say Hun Sen remains subservient to Vietnam’s leaders. Regardless, the cozy ties are chief among the list of complaints that Rainsy and the CNRP has articulated throughout the campaign. Sunday’s election will determine the 123 members of Cambodia’s Rotsaphea, or National Assembly (រដ្ឋសភាជាតិ), and it seems almost certain that the Rainsy and the CNRP will improve on their previous effort in July 2008, when the CPP won 90 seats and the two constituent parties of what is today the CNRP won just 29 seats. It’s useful, to some degree, to compare Cambodia’s vote to elections in another southeastern Asian country earlier this year — Malaysia. Despite their proximity, the histories of the two countries are, of course, very different. Malaysia is a country divided by ethnicity (Malay, Chinese and Indian), it was shaped mostly by British colonial institutions and post-colonial Chinese entrepreneurship, and its experience has been mostly steady economic growth for nearly a half century. Cambodia, although much more homogenous ethnically (nearly 90% Khmer) has had a rougher time since achieving independence from France in 1953: drawn into the quagmire of Cold War geopolitics during the war in neighboring Vietnam, divided by civil war in the 1970s, and still haunted by the brutality of Pol Pot’s regime after the communist Khmer Rouge took power from 1975 to 1979. But in both cases, it’s difficult to avoid the conclusion that elections are fraud-ridden and not exactly fairly contested; in both cases, there’s also a realistic case that the ruling parties have such a deep-rooted base of support that their genuine reelection can’t be necessarily dismissed out of hand. In the case of Malaysia, prime minister Najib Razak and the Barisan Nasional (BN, National Front) have long depended on support of the bumiputera, the ethnic Malay majority by using government to provide ethnic Malays preferential treatment. In the case of Cambodia, Hun Sen’s support derives from his reputation as the man who brought peace to a war-weary Cambodia, then launched the country on its path toward economic growth by transitioning from a planned economy to a market economy in 1995. As The New York Times reported earlier this week, even former Khmer Rouge militants now support Hun Sen.